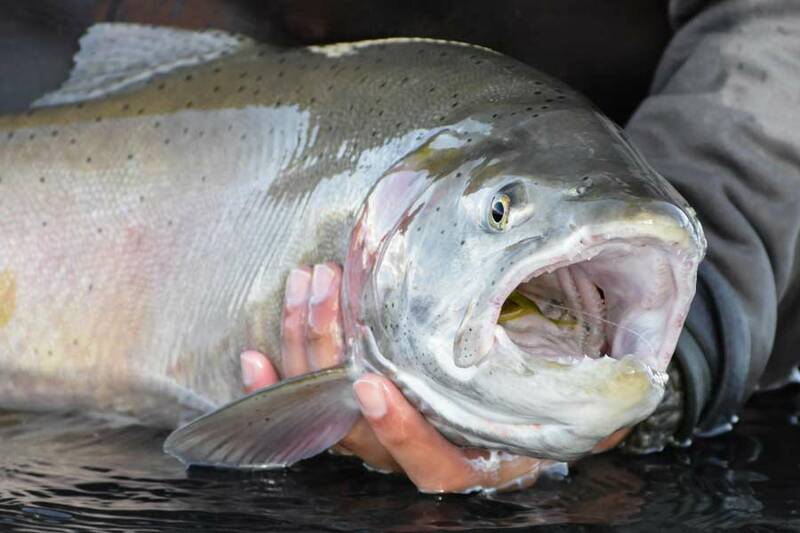 Angler Brad Bonnet shows off an 8-pound Lahontan cutthroat trout at Pyramid Lake. Days before any fishing trip to a new place, you’ll find me digging for as much information as I can. My internet favorites become littered with links to maps, fly-tying videos, forums, and blogs. 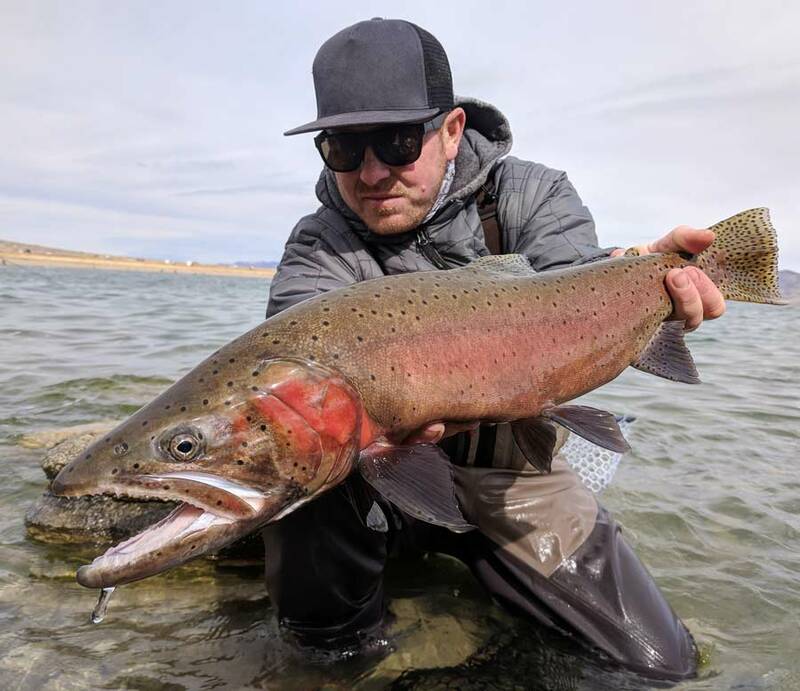 A quick internet search about Pyramid Lake will not only fill your screen with amazing photos of some of the largest cutthroats you have ever seen, but also images of people fishing from the most creative homemade ladders you can imagine. 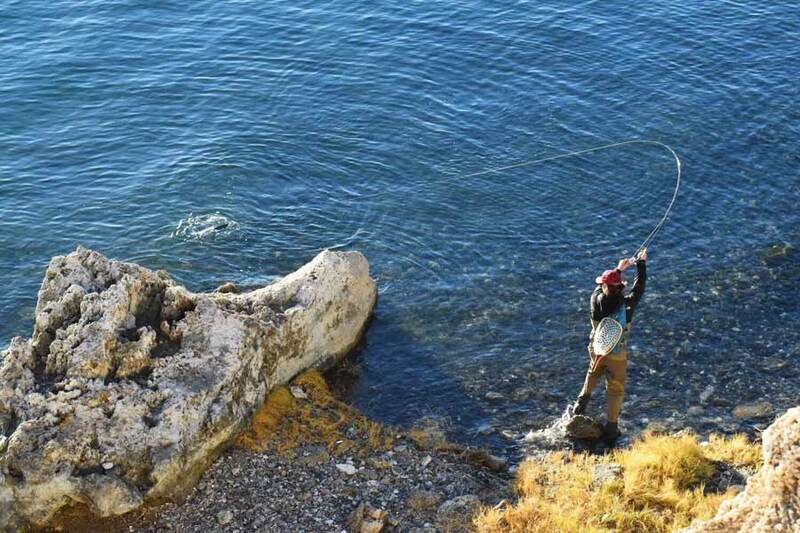 Clearly, there are very unorthodox methods of fishing involved here, and the list of gear regularly used at Pyramid Lake doesn’t end with platform ladders. You will read about heavily weighted lines, large fly rods, and strange sinking beetle patterns. I don’t have a lot of fly rods, so bringing the recommended gear wasn’t an option. It was a little discouraging at first, but the day came, and we hit the road with our 6-weight rods and high hopes of making them work. Zach fights a fish on his first cast of the first day. When departure day came, there were six of us planning to go. We discussed plans to meet up later in the evening, as the first wave got an early head start. Another couple was leaving at midday, but my friend Billy and I weren’t going to be able to hit the road until after work. Like most trips, my excitement for this adventure made the time seem to crawl by. Just a couple hours before it was time to leave, Billy reluctantly let me know he couldn’t make it anymore. 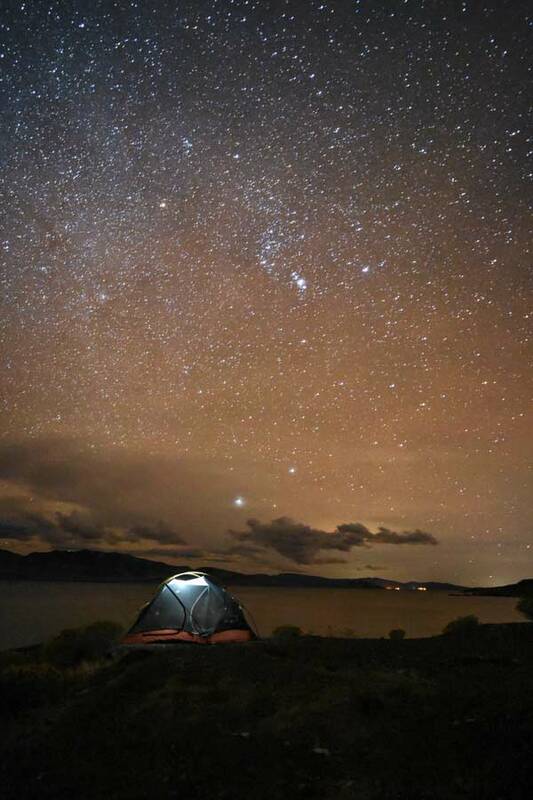 Pyramid Lake is in western Nevada, roughly eight hours away from my home in Salt Lake City, and although I would have ventured out solo, I really didn’t want to go it alone. I texted a guy named Zach, whom I had met at the fly counter of a local shop just a couple weeks before. With only two hours to get ready for a weekend trip, he gave me a very enthusiastic Yes! Not only did he offer to drive, but he also saved the day when I had forgotten to bring my sleeping pad. He is now a close friend, and we have shared several days on the water since. Rebecca and Evan prepared breakfast as the sun rose. Food is rarely a top priority on people’s camping checklists, but when we go, meals are more elaborate than I create in my own kitchen. Each person takes a meal assignment to share with everyone, and we take it very seriously. It’s not unusual to find folks at our campsite enjoying Mesquite chicken and corn salsa tacos, or sausage-and-egg croissants dipping with raspberry chipotle sauce. On this trip, our first morning was filled with the smells of blueberry french toast with bacon, and accompanied by the sounds of Zach catching his first Lahontan cutthroat just down the bank. Zach’s tent was perched on the edge of Warrior Point. Zach and I didn’t arrive at the lake until nearly midnight, and we were only able to find part of our group. We had been sitting down for several hours already, and were not about to go searching for them. We were not about to call it a night yet either. So, to celebrate a safe arrival, we cut some empty plastic bottles into make-shift wine glasses, and started setting up camp on the tall banks of Warrior Point. There was a slight smokey haze in the air, but the skies above were clear, and the stars were bright. Both nights were just like this, and made for some fun late-night photographs. Angler Brian Harris with his largest catch of the trip. First thing in the morning, Zach was able to catch two of Pyramid Lake’s famous Lahontan cutthroat trout. After seeing those spotted backs, rosy red cheeks, and the chartreuse Clouser minnow in its lip, I thought that things were already looking promising. Well, it probably doesn’t come as a shock when I tell you those were the only fish caught on the trip. It’s a tale as old as time, and after a couple more hours of trying, we loaded up to go find the rest of our group. If you’ve never looked at Pyramid Lake on a map, it’s big. Finding our friends wasn’t going to be easy, and it resulted in many fishing stops along the way. Like many fishermen, we didn’t want to be crowded around everybody else, so we kept picking spots that weren’t very busy, but we still weren’t having much success. Late in the afternoon, we had finally found some cell service. We made a call to someone we knew at Pyramid Fly Co. in Reno, hoping to get some advice. He was quick to share his knowledge of the lake, and told us, “Find the people, find the fish.” So, despite us being the type of anglers that usually head out in search of solitude, we hopped back on the highway looking for crowds. Not only did we find the other part of our group, but they were having much better success. We quickly elbowed in on the shore, but our luck, or lack thereof, continued, and our nets stayed dry. Other people along this beach were doing great though, and we got a great opportunity to share a few drinks, have a lot of laughs, and see some amazing Lahontan cutthroat that had grown to nearly 20 pounds. If netting some of the largest cutthroat trout in the world isn’t on your bucket list, it needs to be. 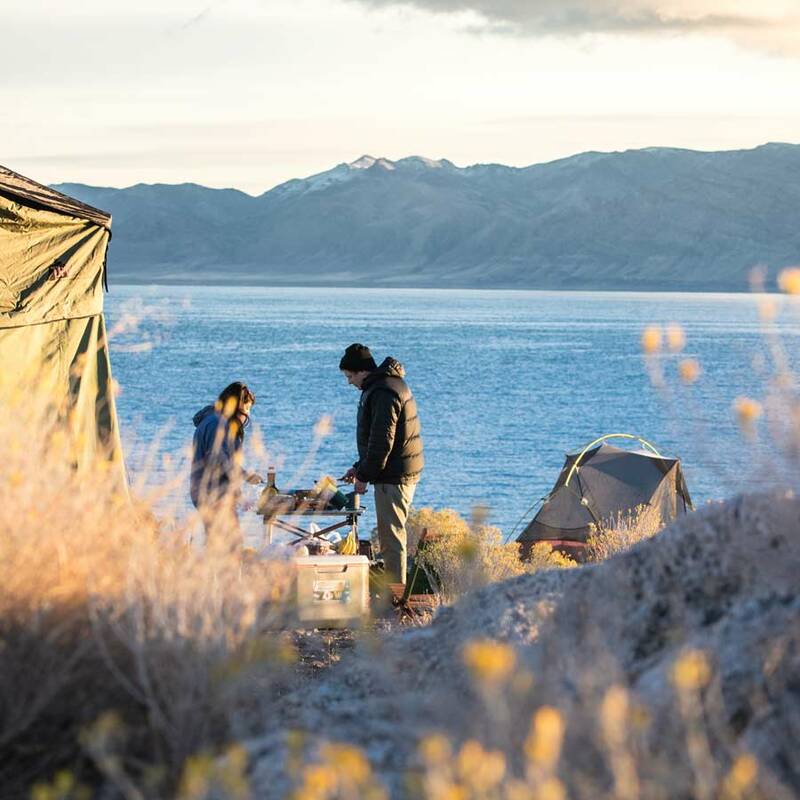 Pyramid Lake is one of the largest natural lakes in Nevada, with salty waters that are home to some truly impressive trout. The fishing methods can be as unusual as the rock formations that surround it, and its shores are often very gradual and speckled with ladders. It’s a unique place, that offers a unique reward. I just hope your rewards include more fins and scales than mine did. 1. “Went anyway”. Spot on. It can be so tempting to change your plans with such up to date information available these days. Good read.